White Roses combined with Yellow Asiatic Lilies, White Lisianthus and Foliage makes this bouquet an absolutely stunning gift, for when you want to impress hugely and make everyone else green with envy.Lilies may be sent closed/partially closed in order to prevent damage and to last longer The vase pictured is not included, however if you would like to make your gift extra special, why not add a vase to your order? We have 3 vases to choose from; Standard, Premium, Superior. Ordered online, easy. Flowers delivered next day as requested. Perfect. The delivery was spot on time. My mother raved about the flowers. Fabulous! 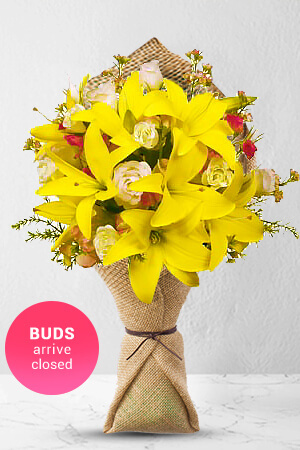 I was a little nervous about sending flowers to Thailand from Australia, but zFlowers.com were easy to order through, and kept me informed when they couldn't be delivered on the same day. They were received the next day very happily! Fast, easy ordering. Good selection of flower arrangements. Timely and efficient delivery. Will use again.